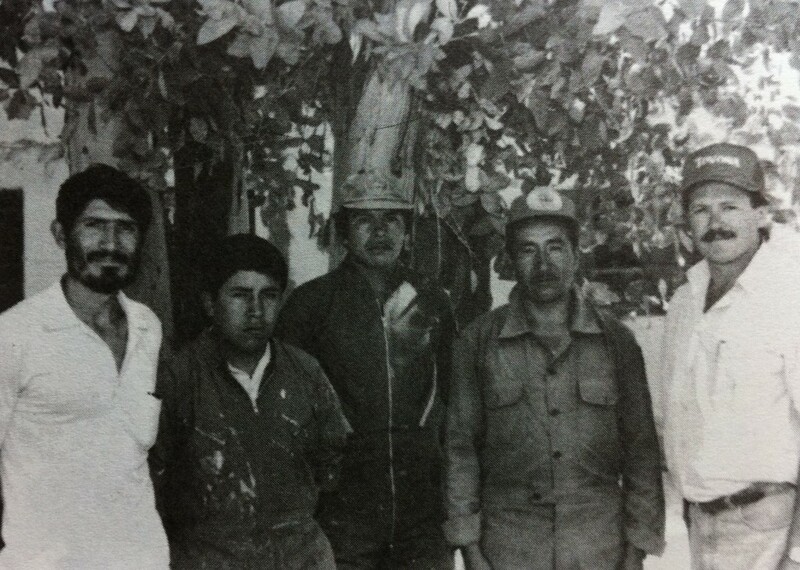 (L-R) Don Jaime, Various Miners, Magnum P.I. Since neither set of our parents were really into the whole ‘looking out for you’ deal, Joel & I mostly just roamed free around the countryside growing up, chatting to homeless people and playing in filthy, dark alleyways whilst child slave traders looked on with a gleam in their eye, dreaming of thumbing through reams of greenbacks. Thankfully for us, the head of the school’s Maintenance crew occasionally took over the parental duties and did his best to keep our adventuring as safe as possible. This was arduous work as we got in the workers’ way all the time and were essentially thorns in their sides. We used to play idly with the lathe in the workshop, after plugging its bare wires into the socket to power it up, build forts out of their construction materials, or sit on the roofing scaffolding with them while they put the hay and plaster ceilings in. One time Joel was given a bullet with a ring on it from one of the temp workers, to put on his necklace. The guy said he had another one at home that he’d bring in for me; but he never did. I wanted to stab Joel that day out of jealousy. I’m sure we could have found something in the workshop to cut a bullet in half. Anyways, Don Jaime was the man and he was the man because he owned a massive truck. With a windmill behind him in the right light he looked like Don Quixote. And like Macgyver before him he had no last name. Just Don Jaime. 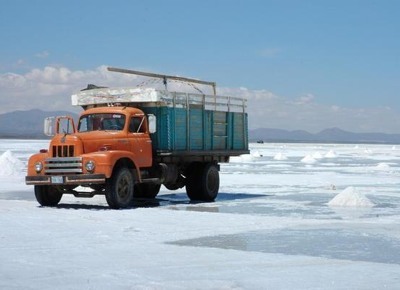 His truck was great, because outside the mythical caring gaze of our parents we could travel in the back of the truck on top of loads of garbage, rocks, cadavers or radioactive material whenever he travelled anywhere for the school on dumping trips. At one point they were constructing a new cobblestone road of sorts that would pass through the middle of the school grounds for the buses to come in one end and out the other. I’m not sure whose idea it was but they were clearly smoking substances only legally available in the landlocked nation we called home. But the street (let’s call it Waste of Effort Avenue) went ahead without much fuss even though it took about 8 months to complete about one city block-length of road. This meant plenty of trips in the truck to collect smooth river stones for the cobbling. I’m sure it’s not actually called cobbling, but they’re cobblestones and it sounds vaguely romantic, like little old Swiss men were doing it with tiny mallets or something. Leaving the joyless, life-draining confines of the school grounds, Joel and I would cram in the cabin with Don Jaime and careen along the back roads, enjoying the sweet smell of freedom and human excrement. One trip we rode around in the back, leaning on whatever we could to stay upright, but that was like a game of bloodied and broken human pinball so we sat up front from then on. At least until Don Jaime saw traffic cops at the toll out of town and made us duck down on the floor. Back then I though he was crazy, but I realise now it’s so he wouldn’t get nabbed for a possible kidnap attempt. Looking back, two white kids in the cab of a beat-up old truck driven by Don Quixote would have raised a few eyebrows. Unfurling our limbs we got out at the river and dumped whatever illicit materials we were hauling into the dry riverbed and filled the truck back up with rocks. Not Don Jaime's truck. But close as I could get. And ignore the salt. Pretend it's cocaine or something. I imagine it would have been much quicker without our ‘help’, but Don Jaime was a patient man. 2 hours later, perched atop the 4-ton pile of rocks in the now bursting truck, we’d return to the school triumphant and clinging on for dear life, overjoyed that the old beast struggles to make it over 20 miles per hour. Post dumping, the rocks would sit in a pile for a while, certainly fort-worthy but having a tendency to fill up with spiders and other nasties pretty quick. Rock pile forts, while resistant to the elements, were backbreaking work, and of course you could get your skull crushed just by looking out the window, so we stuck to old boxes and stolen construction materials for the most part. Once the trip took longer than expected and we stopped for lunch at Don Jaime’s on the way back. His rotund wife made us peanut soup, and one of his numerous sons went to the store to get us some coke: part of your complete Bolivian breakfast. I don’t remember what the soup was like. Peanutty probably. The coke tasted like coke. I was very humbled though, sitting there in a dirty little adobe house, not a care or want in the world, served soup by a lovely family that probably couldn’t afford it, who got stuck looking after 2 MK’s who should have known better but honestly, wouldn’t have had any food at home anyway. Besides, the table in our rock fort was pretty wonky. Posted in Bolivia, CharactersTagged carachipampa, cobblestoneBookmark the permalink. haha… thats awesome! Don Jaime was the man and those trips were always so much fun. and id totally forgotten about that bullet. i did feel pretty cool, sorry ardin. i went back to his house last time i was there. has changed a bit. I don’t know – the things you got up to when you were young! I blame the parents myself! That’s an urban legend. He was born in a test tube in the fires of mount doom and therefore the concept of first or sur-names doesn’t apply.